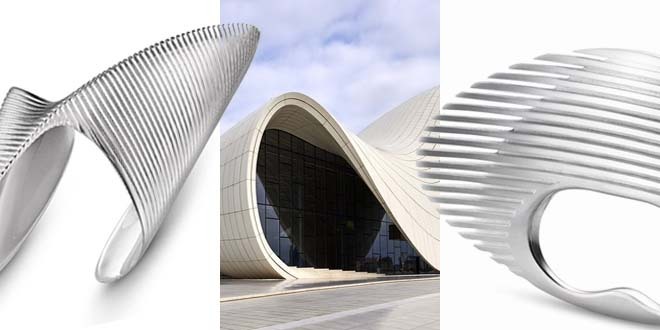 Zaha Hadid was born in Iraq. Then she lived and worked as an architect in the United Kingdom. She became the most significant female and star architect. She was the first woman to receive the Pritzker Architecture Prize in 2004. Whatever she did, she created something genius. Whatever scale she used: such as buildings, furniture, vase, shoes, jewellery, she created something unique. Her buildings are very typical, recognizable and unconventional. She used the same kind of plasticism and organic waves, dinamic forms in her jewelleries and in her great building complexes. The most famous Jewellery Designers invited her to work together, just like Bvlgari, Swarovski, Caspita and The House of Aziz & Walid Mouzannar. She used silver, 18 carat gold, rhodium plate, diamond or transparent resin for her jewelleries. This scale difference is so exciting, because when you design as an architect you use centimetres and meters, while designing jewelleries tenth of a millimeter accuracy is required. This gives the specialty and the essence of the jewelleries and the soul of each creation. There is nothing common in individually designed jewelleries and that makes them so unique. If you are interested in what kind of jewelleries I design as an architect, visit my Homepage. You have the possibility for custom orders here. For photos visit Zaha Hadid’s Homepage. Find Zaha Hadid’s portait photo here.